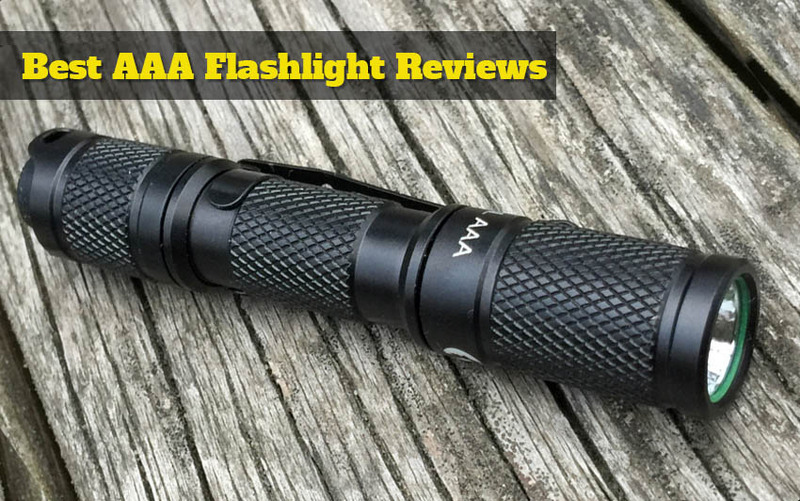 For those of you who sit on the fence and can’t decide already which type of flashlight to get, get down with it right about now and get yourself an AAA flashlight. If not for the performance, at least for the ability to carry it pretty much anywhere. An AAA flashlight is typically small, which makes it so easy to carry around. Don’t let the small size misguide though as the flashlight may give quite some light. Additionally, when the batteries run out…you’re only one minute away from the first store where you can buy new ones. We like the AAA flashlights as they are reliable and efficient, without presenting the sophisticated features of the new wave of high-tech flashlights. After all, all you need in the dark is some light to see where you’re going. The AAA flashlight is great for emergencies and due to its size; you may always throw it in your backpack or clip it in a pocket. It’s very easy to access and to use, becoming an ideal option for your EDC activities. It’s compact, which makes it so comfortable to store/carry. It’s also lightweight so you may forget you have it on you. Don’t listen to others – you can put your trust and faith in an AAA flashlight. It may surprise you with its performance and lumens. Even though they’re not the toughest or the brightest out there, and perhaps not as long-lasting as a CR123 rechargeable light, AAA flashlights compensate with small size, light weight, bright light and… ease of finding brand new batteries. 1. Don’t let the price fool you, since the LE CREE LED Adjustable Focus Mini Tactical Flashlight Torch a pretty bright and dependable flashlight to rely on in many situations. The flashlight provides 140 lumens light and its beam travels up to 500 ft. the focus is easy to adjust, helping you spotlight for longer-range observation. When you want to light up a larger area, you may confidently use the floodlight feature also. You need to use three AAA batteries for the flashlight and they don’t let you down as soon as you’d expect. The body of the flashlight is rugged as it’s made with heavy-duty aluminum. It’s scratch and fade resistant and looks very nice. The flashlight takes a fall, as it’s shockproof and vibration proof as well. The flashlight looks well made and it’s easy to use. You may easily slide it for zooming and use it in a rain since it’s water resistant. Despite the minor drawbacks, we still like the flashlight for all the good things it brings, especially considering the price. 2. Let’s get something straight: we all needed a flashlight when lights went down all of the sudden in the house. 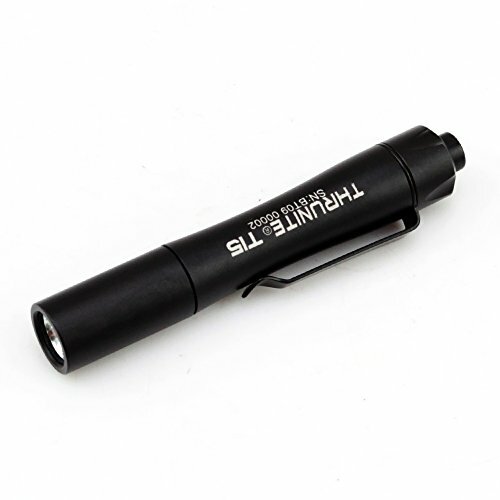 The best part about the BYB Super Bright 9 LED Mini Aluminum Flashlight with Lanyard is the fact they are so very small, efficient and you may practically store them anywhere for emergency cases like this. The 9 LED mini aluminum flashlights (they come in a pack of 4) have just the right size to fit anywhere and to be reliable in an emergency situation. They are compact lights and fit well in any hand. We like the flashlights as they are pretty durable and versatile, being there for you in many types of situations. The light is good and consistent and the batteries last for long. The on/off push button makes the flashlight very easy to use and they only need 3 AAA batteries. Even though they are so small, they are bright and powerful. They perfectly fit in a pocket, anywhere in a room and even in a woman’s purse. 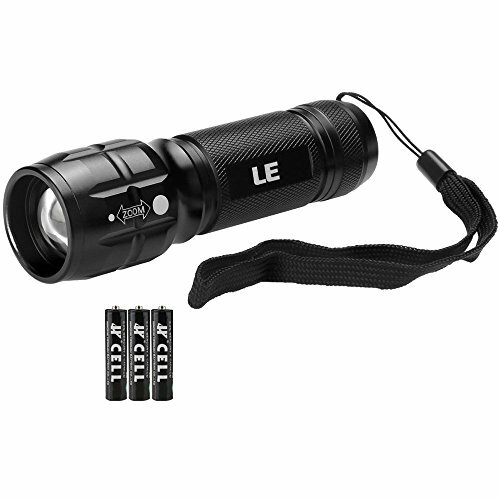 The 30-lumens of light output is dependable for an emergency and the beam travels up to 20-foot away. Along with the durable aluminum body, we also have to notice the pretty looks and colors of the flashlight. The nylon lanyard increases their portability and the tail cap push button is fast and responsive. The flashlights are weather resistant also so you may safely use them on a rainy day. As long as you realize you get reliable, little durable flashlights that save you out of trouble when things go west, you’re good to give them a try. 3. 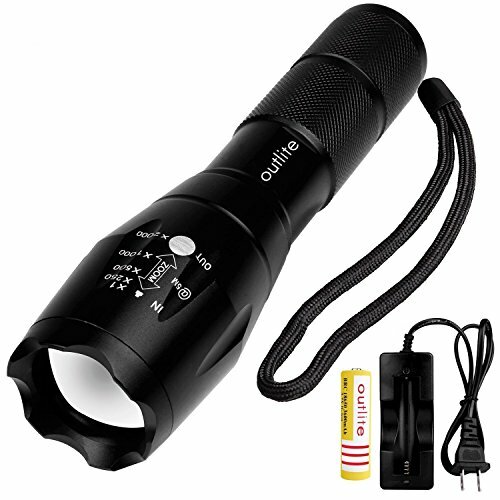 Popular and dependable for many outdoor activities, the Outlite A100 900 Lumens CREE XML T6 LED Portable Zoom able Tactical Flashlight is surely a good option. The 900-Lumen light output is super bright and reliable. It may be short of 1000 lumens, but I bet you won’t notice the difference. The flashlight is versatile as you may use rechargeable 1850 battery or three AAA batteries instead. The choice is yours. The versatility doesn’t stop here and you also get to choose one of the operating modes, just the way you need it: high, medium, low, strobe or SOS for the emergencies. The focus is adjustable and you’re free to use the high spotlight for a long range as the beam travels up to 600 feet. When you have to illuminate a larger area, you may use the circle floodlight. The body of the flashlight is made with aircraft aluminum, which means you may use it in extreme temperatures, high or low. You may also use it on a pouring day, as it’s water resistant. The flashlight is also shock resistant so it can take a drop. The solar powered keychain with LED flashlight is very handy when you’re trying to find the flashlight in the dark. The flashlight is easy to use and to carry around. It has a good size, which allows you to put it in a pocket, easy to reach at all time. The nice feel it leaves in the hand and its rugged build make the flashlight a great choice for camping needs. The lens isn’t as shock resistant as it is the body of the flashlight. We found out the hard way. No matter how we put it though, we still see a dependable, bright and easy to use flashlight that goes great in any camping experiences. 4. The slim profile of the Streamlight 66118 Stylus Pro LED Pen Light with Holster is an important feature that helps it stand out from many other models. Nevertheless, there’s more than small size and slim profile to the flashlight. The C4 LED gives 90 lumens light output and the beam travels as far as almost 60 meters. The battery doesn’t run out fast and the flashlight is reliable for many situations. The push button tail switch is well thought out, even though it’s not as easy as you’d want to operate. The design lets you have momentary or constant on operation. The body of the flashlight is durable as it’s made with anodized aircraft aluminum. The body is also abrasion and corrosion-resistant and the lens match the body as it’s scratch-resistant and unbreakable. Now that we’re on it, we also have to mention the flashlight takes a few splashes as it’s IPX4 water resistant. The flashlight handles a drop or two as well, as long as it’s not for more than 1m. The portability of the flashlight is also something to talk about. Either you use the tear-resistant nylon holster or the pocket clip that’s removable, the flashlight is easy to carry around/fit in your pocket. The pocket clip is sturdy, keeping safely in place the flashlight. The flashlight is very bright for its size and reliable most of the time. Foibles or not, for the slim profile, portability and reliability in so many situations, we still like the flashlight and we think it’s worth a look at. 5. 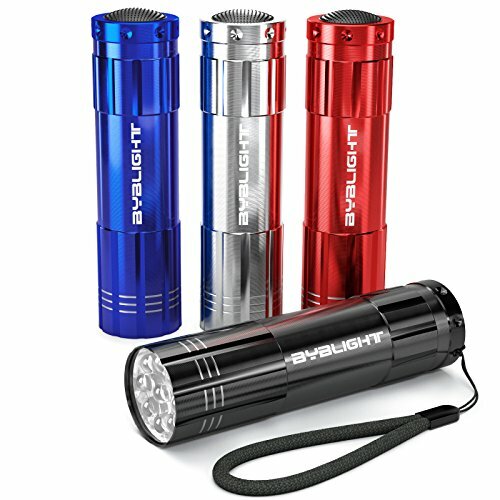 The pocketsize design and compact shape of the Maglite XL50 LED 3-Cell AAA Flashlight maybe its strength, but the flashlight doesn’t on the light performances either. The flashlight is easy to use and comes with many good features for more versatility. You may perfectly use when in need the adjustable LED spot-to-flood beam or one of the three modes: high, 25% energy save power and emergency strobe. The flashlight is easy to find and the pushbutton tail cap switch is responsive and easy to push. The anti-roll build, the pocket clip add up to the list of good features. The flashlight has a compact and small size and it’s so easy to carry/store. The anodized body (inside and outside) give you a flashlight that is corrosion resistant, becoming longer lasting. The flashlight comes with high-grade rubber seals and gaskets to all openings, which expands the lifespan of the flashlight. The handle gives a great, sturdy grip and the flashlight feels nice in hands. You may take it out in the rain since it has an IPX4 waterproof grade. Made in our USA, the flashlight is a sure buy, no matter how you put it. 6. If you’re looking for a dependable, always ready to use small flashlight, you don’t have to search high and low anymore and give it a go with the ThruNite Ti5 Compact LED Penlight Max Output. 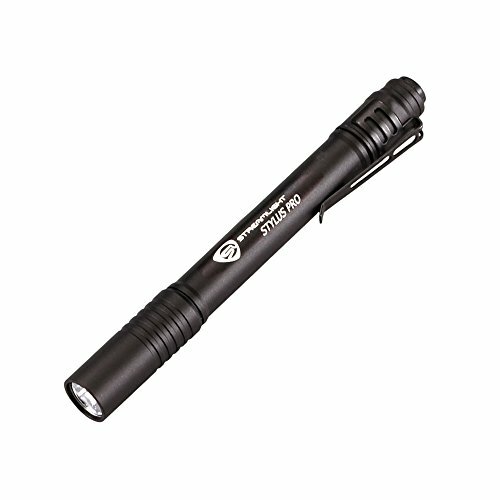 The flashlight has a “penlight” style, which makes it so easy to carry it around and to put it in the smallest pocket. Even though slim, the flashlight has a hard anodized aircraft-grade aluminum body, which not only is durable and tough, but also has a nice touch soft feel it. It’s very easy to go through the operating modes and you get to choose one of the three, according to your needs: low, high or strobe mode in emergencies. The firefly flashlight is dependable and its silent momentary-on “forward clicky” tactical tail switch is great for brief lighting or signaling. The flashlight has a tough build and takes the use in water due to its IPX-8 waterproof grade. The tough stainless steel pocket keeps the flashlight tightly attached. The light is bright and the flashlight has a fair throw. The beam is round and nice and the maximum output is 100 Lumens. Lightweight, easy to use and to carry around, the flashlight manages to light your way when out in the woods. For all the good things it brings to the table, if you’re into firefly flashlights, don’t miss this one. 7. When you give it a try with the Coast HP7 Focusing 360 Lumen LED Flashlight chances are you’re gonna think positive about the bright light and overall quality. The flashlight gives 360 lumens light of output, but you may also use the 50 lumens light when the situation calls for it. The beam travels pretty far (up to 741 ft.), whereas the minimal is 246 ft. the Pure Beam Focusing system is efficient, whereas the Slide Focus lets you choose one of the three modes: low, medium and high. The beam is a nice perfect circle and the light pattern is so good. The anti-roll tail cap is great for the uneven surfaces where the flashlight stands on its own, without rolling off. 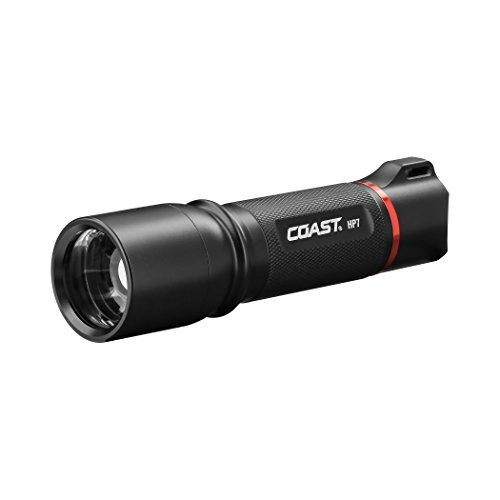 The flashlight presents a rugged, long-lasting body that handles impact and challenging weather conditions. Additionally, the LED is supposed to be unbreakable. Easy to use, the flashlight comes also with a handy belt-holster and lanyard, becoming more portable and easy to store. For the great light pattern and adjustable focus, the flashlight remains one of our favorite choices out there. 8. 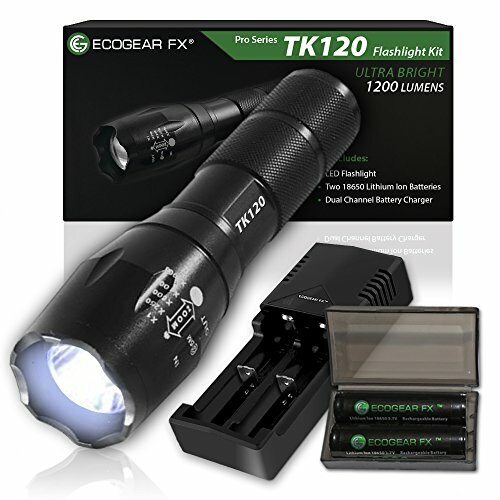 One thing we do know about the EcoGear FX Tactical LED Flashlight Kit is its versatility as you may use AAA batteries or rechargeable 18650 battery. However, the flashlight brings a lot more to the table and it’s impossible not to like all the items that come in the package, along with its performance and build. The Cree T6 LED chip gives an impressive 1200 lumens of bright light and the flashlight is handy in so many various situations. It’s great for home use, but handles the outdoor challenges rather well too. You may always choose one of the five operating modes: low/medium/high/strobe or SOS. You may use the zoom function when in need. The flashlight is made with long lasting aircraft aluminum alloy, taking the intense use for quite some time. The hard-anodized finish is a great plus, not to mention the water-resistance ability. The flashlight takes a wall as it’s shock-proof and its anti-abrasive build expands its lifespan. We also like the good design of the flashlight that ensures steady and comfortable grip at all time. Even though it’s easy to use, the risk for accidental operation is minimal. The dual channel battery charger, the battery storage case and all the items included make the flashlight a great investment of your money. Nevertheless, for all the great things it brings to the table, we’re pretty sure you’re not getting a lemon with this one. 9. Made in our USA, the SOLARAY PRO ZX-1 Tactical Series Professional Flashlight – Our Best and Brightest Tactical LED Flashlight with Max 1200 Lumen uses CREE XML bulbs, which sure explains the bright light and efficiency in all sorts of situations. 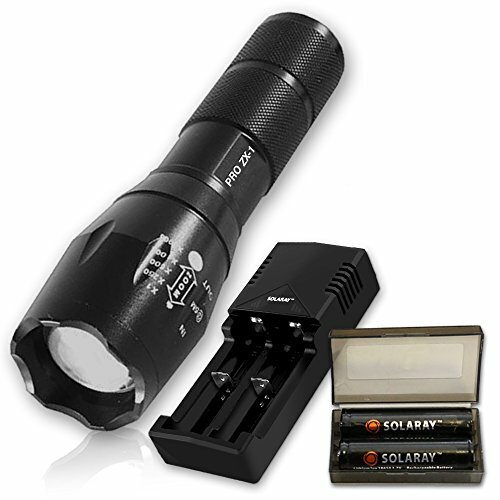 The flashlight is designed and made with the needs of the personnel in Police departments and Military Special Forces. This is why the flashlight is well made, taking not only the intense use, but also the heavy-duty jobs. Taking a closer look to the performances, we notice the adjustable zoom focus lens that help you for a close up or a longer-range observation when in need. The 1200lumens light output is amazing, whereas zooming is nice and smooth every time. You may depend on the flood beam and all the five operating modes: high, medium, strobe, and SOS mode. The body of the flashlight is made with aircraft grade aluminum and this means it can sure a drop or to. At the same time, the flashlight is water-resistant, so no worries on a rainy day. The portability is another thing to mention and the Deluxe Lanyard isn’t just pretty looking, but also strong, keeping your flashlight safe and handy when out on the run. The flashlight comes in a package that also includes a Multi-Purpose Dual Battery Charger (overcharging protected) and two powerful Premium Solaray rechargeable 18650 Li-Io batteries with circuit protection. The flashlight is small, yet strong and has a great balance that makes it so comfortable for carry. For what it’s worth, the flashlight doesn’t disappoint on so many levels and those sure counts a lot more than some minor downsides. 10. There are many things to like on the LED Lenser – P7QC Quad-Color Flashlight that has just the right size and just the right weight for an easy and comfortable carry. The flashlight gives up to 220 lumens light and it’s minimum is 40 lumens. The beam travels up to 60 meters and the batteries should hold you for 20 hours or so. The quad color feature of the flashlight is efficient so you may use the white in the dark night, the red light for signaling, but don’t hesitate to use the blue light for that also. You may use the blue light for following some blood trails and you can definitely rely on the green light for better contrast in low visibility conditions. Some use the green light mostly when fishing. You also get three operating modes that work on all colors: full power, low power and defense strobe. Going through the colors and switching modes is smooth and easy, even with your gloves on. The flashlight has a good fit and finish and you may safely use it in wet environments as it has an IPX7 waterproofness grade. We like the finishes a lot and the flashlight doesn’t have any rough edges. The lanyard makes it easy to carry anywhere you’d need. Regardless the minor issues, the flashlight is a good choice for any hunter, to say the least.